What is it about certain country house hotels that offer that special 'feel good' factor which warms the spirit and heart of the weary traveller? It's not something that can be simply bought or designed as part of the fixtures and furnishings. It's that elusive sense of calm and contentment that cossets the guest in a private, carefree world. Like the annual Oscars ceremony in Hollywood presented to the best movies, directors and actors of the year, hotels are visited and assessed by industry professionals to judge their individual standard of performance, star quality and overall excellence. Visit Scotland grades Cromlix House as a five star luxury small hotel while the AA includes it in their prestigious list of the top 200 hotels in Great Britain and Ireland. If that in itself is not an invitation to book a visit, the AA has selected Cromlix House to be one of the top ten hotels in Scotland in recognition of its "outstanding quality, comfort, cleanliness and customer care". Certainly high marks from the AA report but it all sounds rather bland as described in such formal terms. What is it really like to stay at Cromlix House, to eat, sleep and dream there, to experience this quality of comfort and care? I decided to investigate and check out what makes it one of the top ten hotels in the country. 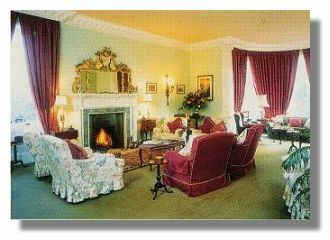 Cromlix House is a truly hidden gem, which you would not likely come across by chance on leisurely drive around Perthshire. Yet it's so conveniently located, easy to reach, within 40 minutes drive from Glasgow and about an hour from Edinburgh. Take the road off the A9 for the village of Kinbuck and soon you'll be turning through the lodge gates and making your way slowly, watching out for pheasants, rabbits and squirrels, up the two mile tree-lined drive, around the final bend for your first glimpse of the House - a stunning soft grey stone turreted Victorian mansion. Whenever you step into the outer hallway cluttered with rows of green welly boots, walking sticks and fishing rods, you feel immediately at home as if arriving at a private country house or shooting lodge. From here into the main hall with its traditional wood panelled walls, a cluster of comfortable armchairs and the rich peaty smell of a log fire creating a genuinely warm welcome. It's about five o'clock on a chilly wintry afternoon when we arrive and a couple of guests are relaxing by the hearth enjoying tea and scones, adding even more to the homely atmosphere. The disguised reception desk is a small oak table with a brass bell that instantly summons personal attention. We are taken up to our bedroom, Lower Turrett, by Peter who has recently come from Poland to learn all about Scottish country house hospitality [and who still seems slightly in awe of its historic grandeur.] But then so are we. The bedroom turns out to be a lavish suite of rooms with private sitting room, [TV, writing desk, armchairs], a walk-in closet, bathroom and an enormous bedroom with bay window offering superb views across the gardens. As well as beautiful thick drapes, there are original working shutters - which are later closed during the turn down service while we are at dinner. At Cromlix there are eight suites and six spacious double rooms, all of a very individual character, colour schemes and furnished with Victorian furniture, fine antiques and paintings. Only a few of the bedrooms have the classic and stylish Victorian roll top baths and one with an original WC, while others have modernised suites which look rather out of place. In Lower Turrett there is an imposing six foot mahogany chest of drawers and also a freestanding dressing mirror complete with candlesticks, which was tempting to use - but electric light seemed more sensible. It's all extremely comfortable and relaxing with a homely attention to detail: Molton Brown toiletries, bathrobes and the two bedside cabinets are stuffed with books - biographies, thrillers and romantic fiction - perfect for a wet and chilly weekend. 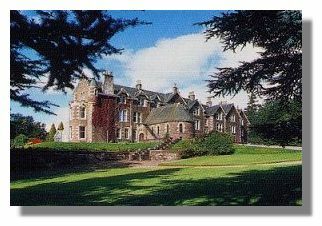 The Cromlix estate and the original Cromlix castle date back to the 15th century, the family seat of the Drummond family for over four generations. In 1874 it was decided to build a Cottage for weekends and holidays. The "rustic" design with cosy hall and small intimate public rooms is therefore in keeping with a country shooting lodge, rather than a grand baronial mansion. In the Hall there are original photograph albums, game and fishing records which delightfully captures the way of life during those house parties a century or so ago. 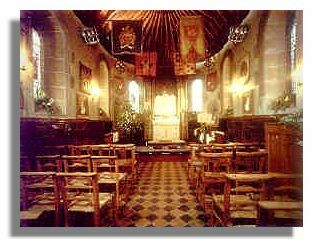 A fascinating aspect to Cromlix House is the addition of a small Chapel, which remains intact today complete with the original tapestries, banners, military drums, bagpipes and the family Bible. The chapel continues to be used for weddings as well as the Christmas Eve carol service and other special events. Couples marrying today at Cromlix Chapel sign the same Registry that has been used by the Drummond family for several generations, adding a very special sense of heritage to the occasion. The chapel is available for weddings, baptisms, and blessings for up to 55 people. A sense of occasion and the Edwardian house party style of hospitality is also maintained for dinner at Cromlix. 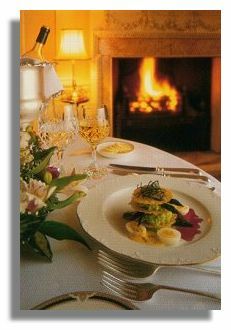 Guests gather between 7pm and 8pm in the Morning Room where a log fire is burning to enjoy an aperitif and a platter of canapés such as delicious tiny smoked salmon rosti cakes. There's a choice of two dishes per course as well as a separate vegetarian menu. 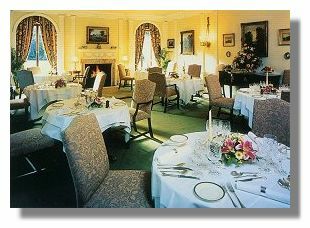 A typical menu might include a starter of Grilled fillets of Lemon sole with Smoked Haddock beignets, linguini vegetables and a chive beurre blanc, then Butternut Squash and cumin soup with a lemon and coriander yoghurt followed by a main course of Roast Loin of Venison with Braised Red cabbage, Fondant potato, Apricot chutney and roast parsnips. For the vegetarian, a spinach and ricotta gnocchi with rocket leaves and then a Green herb risotto with char grilled asparagus and wild mushroom ragout. The emphasis is on an interesting blend of tastes and flavours using the very best local Scottish fish, game and vegetables served with imagination and flair. Complete the feast with perhaps a Glazed Poached Pear and a Butterscotch sauce or perhaps a fine selection of creamy and crumbly farmhouse cheeses with grapes, celery and a basket of biscuits. The wine list is well selected with a fair priced House selection including a soft and mellow South African Pinotage and a clean fresh Sauvignon Blanc from Spain as well as a full list of French, South American, Californian, dessert wines and champagnes. The setting for dinner may be in the elegant and cool yellow dining room or in the bright and sunny conservatory next door - perfect in the summer, overlooking the gardens, but well heated in the winter months. 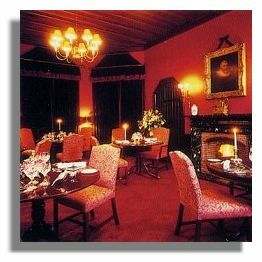 There's also the smaller and intimate red dining room, used particularly for breakfast and when the house is full. Private dinner parties may also take place in the Library upstairs, a room of great character with stag heads around the paneled walls. Wherever you dine in the house you will be assured of a gracious experience with crisp white linen tablecloths, glittering crystal, fine silverware, porcelain and friendly careful service from a team of young waiters. Thereafter retire to the Hall or Morning room for coffee and do not resist the petit fours. The white chocolate-coated lemon sorbet is utterly delicious and the perfect final touch to an exceptionally fine dinner. When staying at a Scottish country house hotel, breakfast is an essential part of the day that cannot be ignored. At Cromlix this is a real feast when you can indulge in porridge with cream, prunes and yoghurt, fried, scrambled or poached eggs, smoked haddock, kippers, bacon, black pudding, mushrooms, all served with homemade white and wholemeal toast, huge pots of tea and coffee and a selection of preserves. To burn off the calories of dinner and breakfast and work up an appetite for lunch or perhaps a tempting afternoon tea - it's time for some hearty, healthy exercise. Just as in the old days of the House parties, shooting and fishing is available by arrangement. Golfers will find several courses in the vicinity. The Cromlix Estate is 2,000 acres of farmland, which offers some excellent walks through woodland, forest tracks and around the three private lochs. We set off on a long trek up to Hillhouse, a remote uninhabited farmhouse high on the hill. The open views here over rolling heather clad hills and barren grouse moors stretching for miles around are breathtaking. Just breathe in the fresh pure air and you'll feel a thousand miles from the city. If you don't fancy a long walk, just behind the house is a small curving lake surrounded by trees where swans, ducks and an abundance of bird life make their habitat. This is a very peaceful place to sit, read or dream awhile. 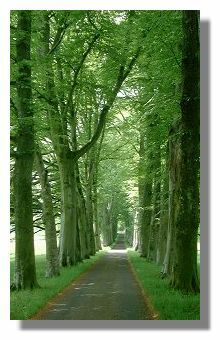 Cromlix House is perfectly located to visit Stirling, Dunblane, tour around Perthshire (the illustration here is the mile-long entrance driveway to Drummond Castle) or over to Loch Lomond with a choice of castles, historic sites, distilleries, sporting and leisure pursuits all nearby. However once you arrive at Cromlix House and cocooned in the comfort and privacy of your bedroom, warmed by the crackling log fires and taste the fine cuisine, there is no reason to leave this uniquely charming, rural retreat for days! "Utterly relaxing", "What a fairytale place", "A memory to last", are just a few more comments in the guest book. That memorable sense of calm and relaxation, of homely care and comfort is an indefinable and elusive thing in the world of hotel living - but you'll find it and more at Cromlix House. For more information or to make a reservation, see the Cromlix House Hotel Web site or e-mail Reservations.